We know that you’re excited to get your hands on the much awaited OPPO F9, but with no news on its availability in the Philippines yet, we’ve tried our best to share with you anything we know about this device. 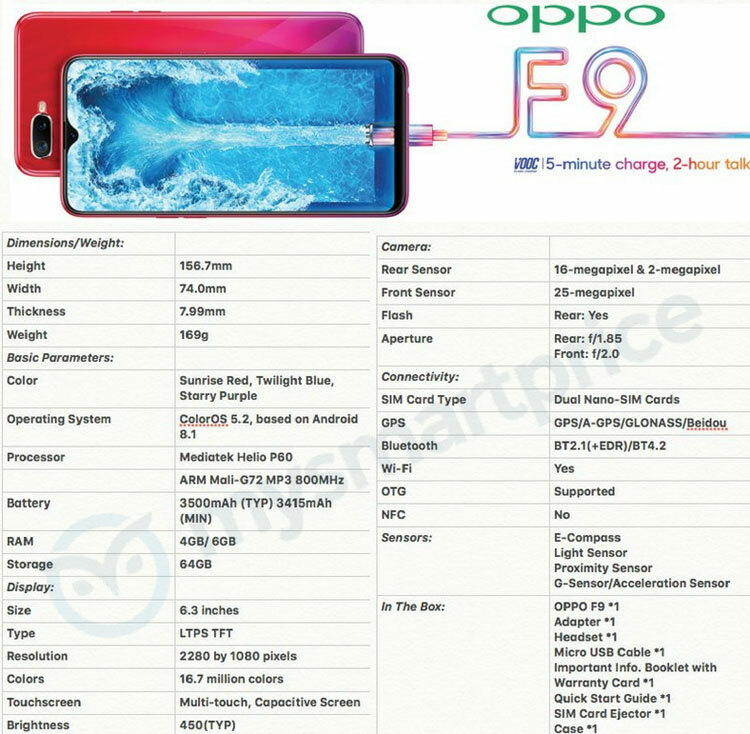 And much to our delight, we came across the purported OPPO F9 specs and features. According to MySmartPrice.com, the OPPO F9 sports a MediaTek Helio P60 processor, 6.3-inch LCD display, 64GB of internal memory, 3500mAh battery, and an amazing 25MP selfie camera! The OPPO F9 will be powered by a MediaTek Helio P60 octa-core 12nm processor similar to those that powers the OPPO F7. The chipset comes with the ARM Mali-G72 MP3 GPU clocked at 800 MHz and features a 2.0 GHz clock speed. The device will feature a 6.3-inch LTPS TFT LCD display with 1080 x 2280 Full HD+ resolution. In terms of memory, the OPPO F9 will come with 64GB of internal memory with a choice of either 4GB or 6GB of RAM. Words has it that the OPPO F9 will feature a primary 16MP + 2MP dual camera setup and a 25MP selfie camera on the front. It will be fueled by a 3500mAh battery with VOOC fast charging for up to 2 hours of talk time from a 5-minute charge. In terms of the software, the OPPO F9 will run on ColorOS 5.2 based on Android 8.1 Oreo. The OPPO F9 and the F9 Pro will be the first phones to feature the new ColorOS 5.2, though there’s no information yet on the operating system’s improvements over the previous version. The OPPO F9 will be available in three color options: Sunrise Red, Twilight Blue, and Starry Purple. The OPPO F9 is believed to cost somewhere between P16,000 and P18,000 when it hits the shelves in the Philippines. OPPO Philippines has not yet revealed the specific launch date, so stay tuned and subscribe to our newsletter or like us on Facebook to get the latest updates on the OPPO F9.